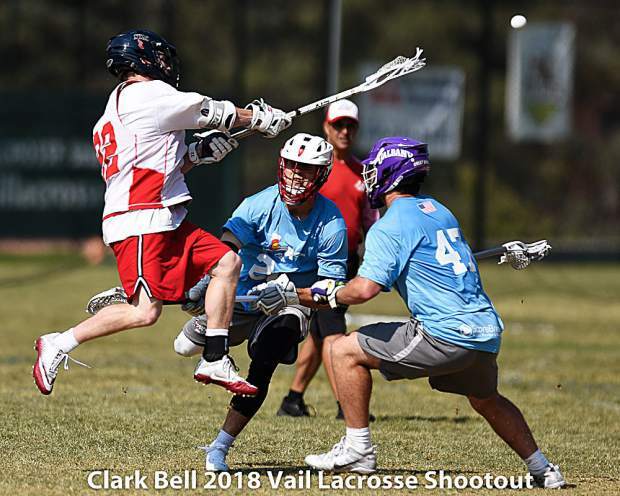 The Vail Lacrosse Shootout culminates on Independence Day in Vail, with the top level men's play on display in Ford Park starting at 9 a.m. The Vail Lacrosse Shootout has narrowed down its men’s master’s division to the final two teams, with Middlebury set to take on WLF Smoke in the Tuesday, July 3, master’s division final. The master’s division is represented by players ages 30 to 39. On the Monday, July 2, matches, Middlebury eliminated Boonedoggle by taking an early lead, scoring five in the first quarter. Boonedoggle was able to hold off much more scoring the remainder of the game, but the team couldn’t find its way to the goal to score and the match was decided at 8-1. In WLF Smoke’s elimination match against the Silver Oysters, WLF held a minor lead during the game, but the Oysters were always close behind. It was the fourth quarter when WLF finally pulled away in the end and won its semifinal game. Middlebury and WLF Smoke will face off at 1 p.m. on Tuesday at the Vail Mountain School fields in East Vail to determine the master’s division champion. Spectators are welcome as the event is free. In the women’s elite division, Tuesday’s semifinal matchup will be determined by the team’s records heading into Wednesday’s finals. On Monday, the women’s elite division saw the Texarados take on Team Wild in Vail. Scoring quickly, the Texarados jumped to a 2-0 lead, which they held through half at 4-3. Bailey Zerr’s four goals led Texarados, while Alli Sciaretta’s four goals led Team Wild. It was a close game until the end, but Texarados ended out on top, 10-9. Meanwhile, the Coastal Colorado vs. LAXaDAZEicalz match was quite the opposite. Coastal Colorado had the lead the first two minutes of the game, but LAXaDAZEicalz caught up and took over after that. They continued to score every couple of minutes to gain a huge lead and an easy win. LAXaDAZEicalz shared the wealth with 11 different ladies scoring in their 18-4 victory. For Team Wild, scoring early and scoring often was the key to establishing control of the game. Amie Dickinson’s four goals and good midfield play led Team Wild to a win. Finally, capping off the day of action for the women, the Texarados defeated Coastal Colorado by scoring within the first minute of the game and keeping the pressure on throughout the rest of the half. Texarados slowed down the game in the second half by moving the ball more, and won decidedly 16-6. The Texarados were led by Bailey Zerr, who scored five goals. In the men’s elite division, which represents the top level of play at the 46th annual tournament, quarterfinal action took place on Monday. Monday’s action in the men’s elite division saw an exciting tiebreaker take place between NYAC and Lax.com/ScoreBreak Elite. Lax.com had the lead early, but NYAC shut them out in the second half, scoring seven unanswered goals to tie the game up. In the end, Jackson Finigan from Lax.com scored the winning goal, his team’s 11th on the day, just 21 seconds into overtime against NYAC. Tuesday’s games between Lax.com/ScoreBreak and Rokk3r/Lacrossewear, and Rocky Mountain Oysters and Big Green Herd, will determine who the championship competitors will be on Wednesday’s final day of play. Those teams are set to square off at Ford Park on Tuesday starting at 12:15 p.m. All are welcome to attend.